Beginning on July 1, 2018, District customers wishing to use a credit / debit card for payment of their bills will have to cover the costs of the fees charged by the credit / debit card company for the use of their cards. Calculation of the fees will occur by the credit card company prior to completion of each payment. Fees may vary depending on the credit / debit card being used by each customer. Customer will have the option of paying by credit / debit card or cash, check or ACH withdrawal. There are no fees associated with cash, check or ACH withdrawals. In staying with the National City Council them “National Night Out, “the Gardnerville Ranchos GID Board of Trustees invites all residents to a Community Meeting on May 4, 2016, Wednesday, 6:00 p.m. at District Office 931 Mitch Dr., Gardnerville Ranchos. The Board will take input and discuss with the public what the District sees happening in the future. This will include our water supply, sewer system, storm drain system, streets, street lighting, parks and recreation. The District will discuss the overall condition of our water and sewer system and what could happen in the future as far as growth and water supply as well as rehabilitation projects for both systems. The District will discuss the state of condition of our streets and rights of way, how the District funds street maintenance and its efforts to obtain ownership of the streets that the District maintains from Douglas County (the District already feels that it owns the rights of way within the District but the County does not). Is the present street lighting adequate? We can discuss any thoughts from our residents. The District maintains its storm drain system. Douglas County in the future may start to charge to maintain the storm drain system throughout the County. How do you feel about that? The District has two active parks, Bluerock Park and Mitch Park. The District owns open space also that is maintained but not developed. Do you want a trail system that could guide you through the Ranchos? Should the District sell open space to get funding to build the trail system? These are some of the talking points that can be discussed at the meeting. Hope to see you there. The National Night Out Community Meeting held May 4, 2016 was well attended by residents of the Gardnerville Ranchos. The hot topic was of course the water meter program. District Manager Bob Spellberg gave a history of how the project got started and the timeline the District is using to implement the project. 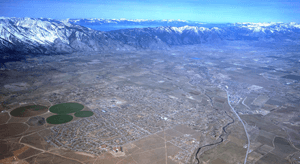 The Gardnerville Ranchos General Improvement District Board of Trustees has designated March of 2017 as the date all homes being served by the District’s water system will be on water meters. The District is offering incentives for users to go on meter earlier than the March 2017 deadline. By going on meter early, the District may be able to install the remaining meters with District staff. This will keep the price of labor down to a minimum. If you would like to learn more about how the meter program started, please check out the District’s website at www.GRGID.com. The District presently has approximately 2,000 meters being read. The goal is to have over 4,000 connections on meter by March of 2017. The following recommendations were adopted by the District Board of Trustees at their January 2015 Board of Trustees Meeting to accomplish this goal. The Board made the following findings and approved of the enticements to owners who install meters earlier. Spring, summer and fall of 2016: The District will offer a 25% discount on all new meters, lids and electronics and allow 180 days to pay for the meter, lid and electronics from the date of installation. Winter 2016 until March 2017: Offer no discount but have a total of 180 days from the date of installation of the meter to pay the cost of the meter, lid and electronics. This is the meter program to help residents get on meter for a lesser amount and eventually being able to finance the purchase. The requirement for installation of a meter for new construction, improvements or change in title will remain. Please call the District Office to request an evaluation so the District can tell you how much the conversion to meter will cost. After the March 2017 date, the program commences and property owners will be mandated to go on meter, not receive a discount but will have an extended time to pay. The District will install meters and send out invoices to property owners. The District may choose to file a lien against the property and/or discontinue water service for non-payment of meter charges. Please contact the District at 265-2048 or email to info@grgid.com if you would like more information on this program.